3 Rodenhaus – Albertson Engineering Inc. This project consisted of removing and replacing existing stacked-stone retaining walls that were failing. 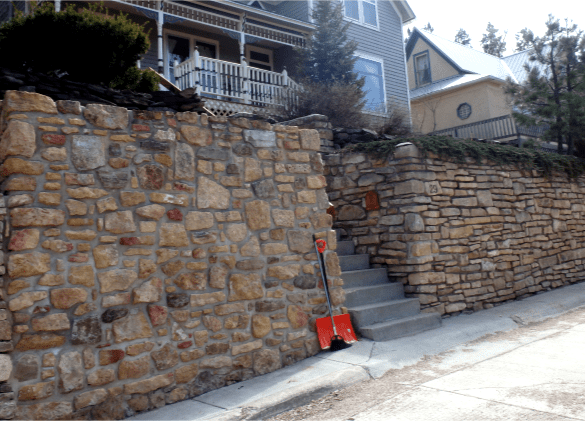 The project was part of the Deadwood Historical Retaining Wall Program. Several different types of retaining systems were utilized on the project. On one side of the house, a Versa-lok wall with Miragrid was designed and covered with a stone veneer to match the historical wall. The ground around the corner of the house had slope stability concerns, so an approximate 4′ cantilevered concrete retaining wall was designed with a 4′ horizontal shelf that sits in front of a 25′ tall Manta Ray Anchor System with a shotcrete face to match the natural hillside color.